Dreadfully smelly and dog-earred new landlord. A pity, because I've previously had good experiences in here, but my last was not so. The beer was putrid and the air was rancid from stale smoke drifting in from the door to the smoking area. As I work across the road I go here for the convenience factor. Took an age to get a simple cheese and Ham sandwich. I shall continue to pop in every now and again out of sheer optimism, but I wouldn't recommend this pub just at the moment, especially when there are better pubs (in every respect) within a few minutes' walk. Friendly landlord and not a bad option for a drink if you are in the area. Traditional local boozer. No bar billiards table anymore. Been an infrequent visitor to this establishment for several years, and at best its performance can be considered "satisfactory" across most key indicators. 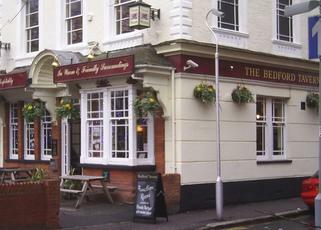 The exterior Victorian grandeur of the Bedford perhaps belies its interior. The pub features standard decor, various tables, and the usual array of gaming machines. Ale selection is limited and uninspiring (think GK IPA, Fuller's LP) - though there is doubtless an equally limited and uninspired set of punters for whom it holds no interest, and in fairness the beer is usually kept well. Food seems to be obvious and unoriginal; again though nothing wrong with simple pub grub and it's not overpriced for what you get. Let's be frank: it is not a pub for a smart city type to take his new lady-friend on a first date. Indeed, the atmosphere will plainly not be to everybody's taste across the social spectrum, especially when it's busy and crammed with chavs and chavesses wearing far too little and drinking far too much. However, all that notwithstanding, one can't accuse the Bedford of being boring. Even if karaoke and loud music and a bit of boisterous behaviour aren't your bag, it is hard to say it lacks character, or has no edge. Actually the place is positively thriving and the landlord is a rumbustious and memorable chappie, as he tends to join in with whatever shenanigans are going on - without losing overall control of the running of the pub it seems. I haven't borne witness to any "trouble", albeit that I might not have been surprised to have been! Essentially an earthy boozer and one which not only suits its context but should be valued to some extent as being a dying breed in Greater London. A quick pint on your lunchbreak and maybe a sandwich is okay. If you're in the right mood, with the right people, a Friday evening here MIGHT just do the trick.... Though it will be kill or cure for most.